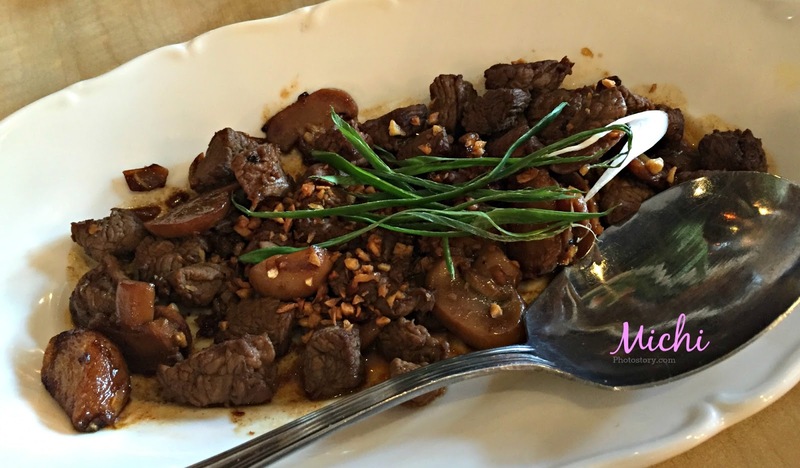 I lived in the Metro Manila for so long so there were so many adjustments when I moved to the province when I got married. 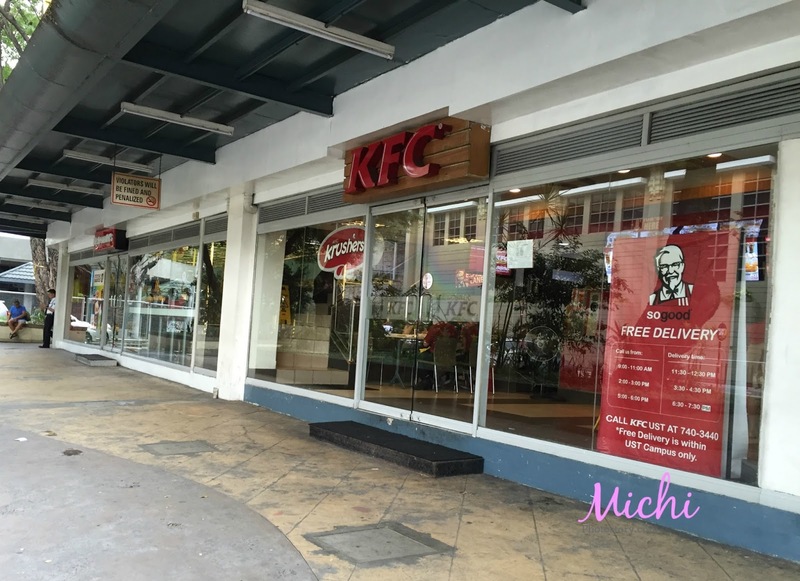 Malls and restaurants are very limited. Malls here are not big. 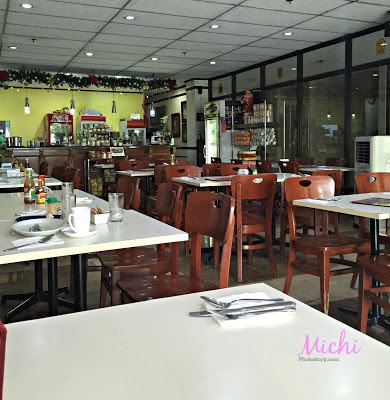 In our place alone, the only fastfood here are Jollibee and Tropical Hut. 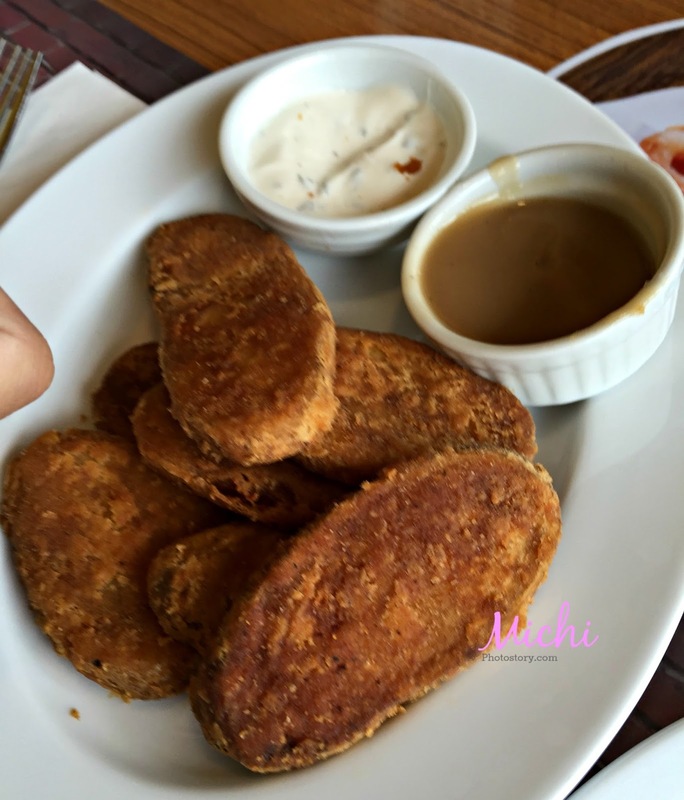 As in for years yun lang pagpipilian so I was really happy when I learned that we have Classic Savory and Shakey’s here. Two weeks ago, we’re hungry and we have no food in the house so I asked my husband to buy pizza for our merienda. 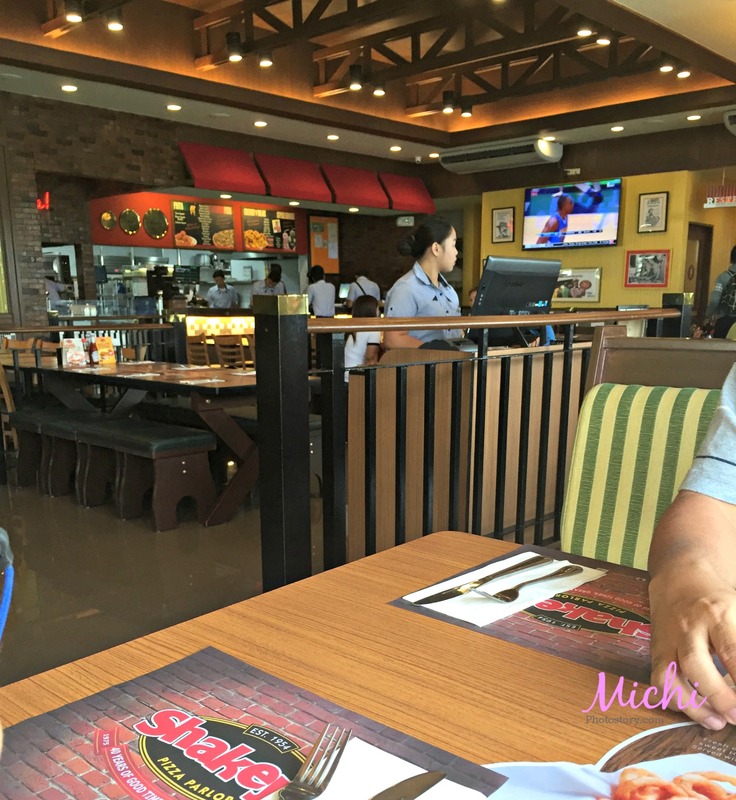 He did not know the number and we had not so good experience with Shakey’s Delivery so we decided to go to the restaurant na lang. We ordered Mojo’s and Dip and Pizza, I did not know na pwede pala yung half-half. Sometimes, it really pays to peruse the menu. 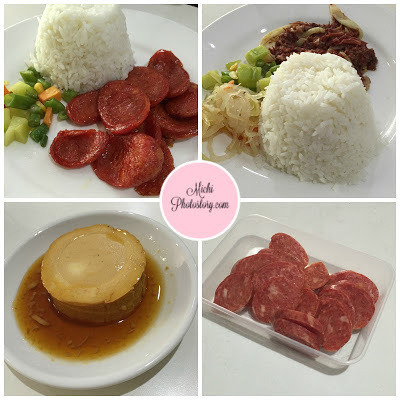 My son likes pepperoni kasi and di ko naman siya trip so win-win yung half-half. Hehehe! 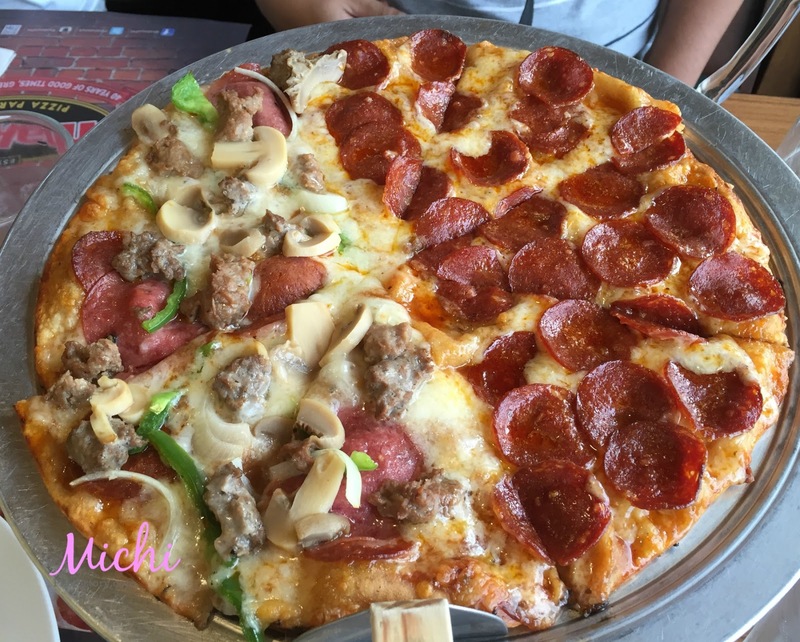 The staff was offering Shakey’s Pizzanatic Supercard but we were still contemplating if we will get a card again. 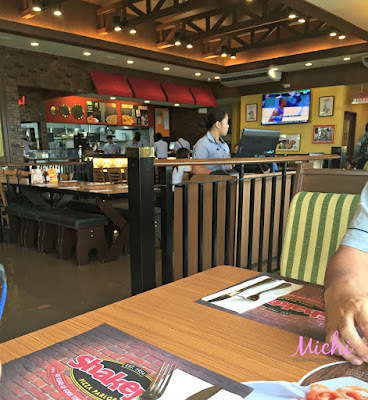 After a week, my friend and I went to Shakey’s to have our lunch before going to the bank. 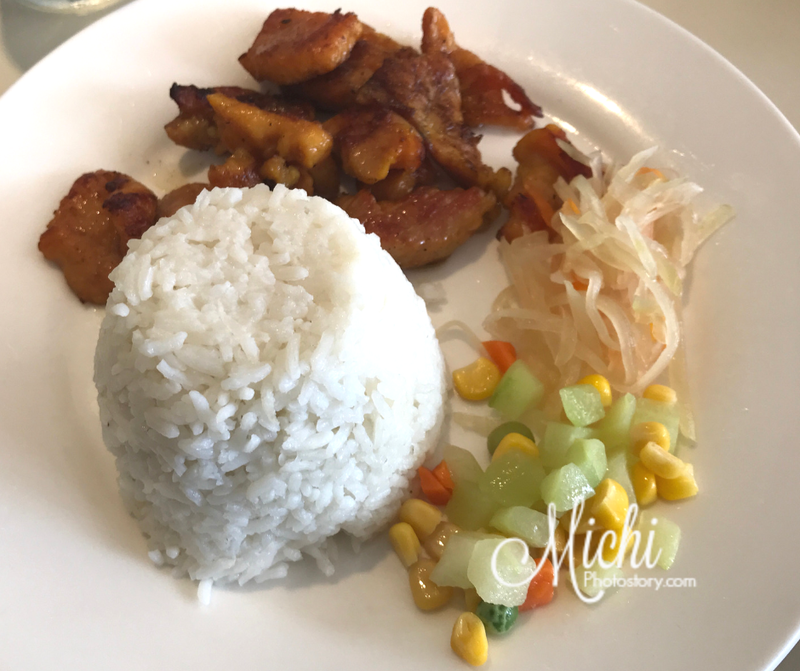 We asked for the lunch set menu and I was surprised to see the menu, our favorite “Bunch of Lunch”(chicken, spaghetti, garlic bread, a slice of Hawaiian Delight and Mojos) was no longer there. 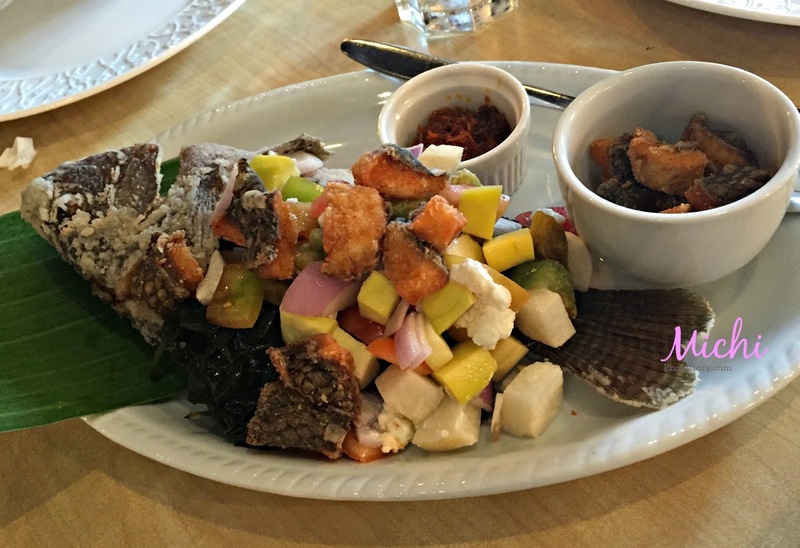 All combo meals have salad, We ordered the 2 Super Platter Meal, Mojo’s and Dip and Rice. 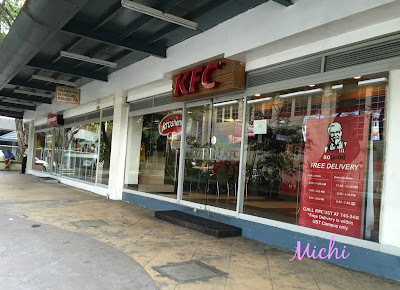 The meal includes two slices of Hawaiian Delight, one piece chicken, mojos, chicken and corn soup and garden fresh salad, spaghetti and garlic bread. They served the mojo’s and dip and soup first. 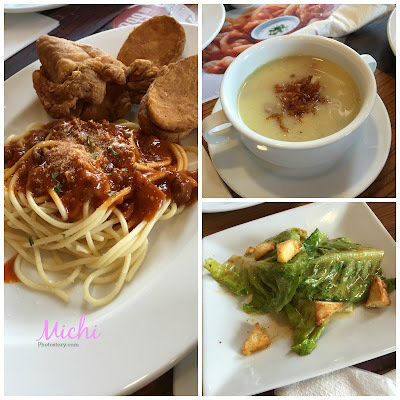 It took them a long time to serve the platter meal and kulang kulang pa, so no picture yung garlic bread and pizza. 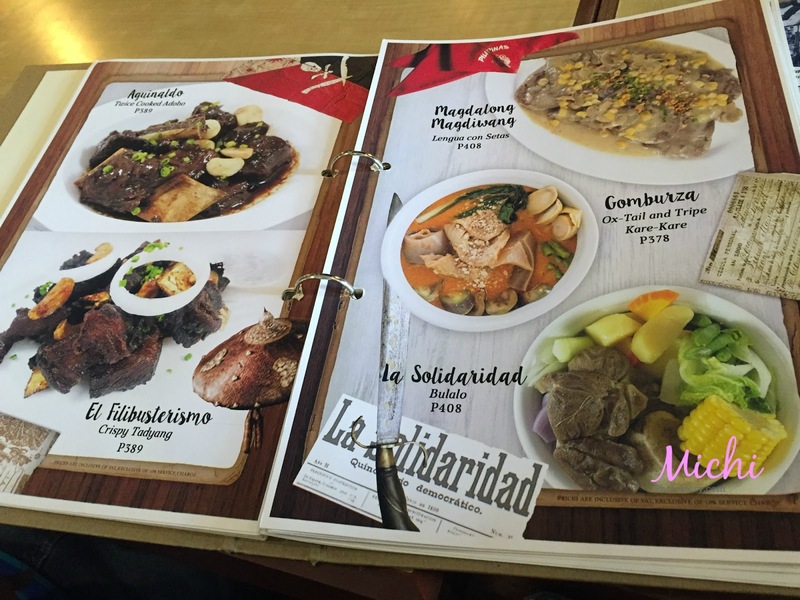 I do hope they will bring back the bunch of lunch set or kulang lang kaya yung nabigay sa min na menu? Any idea? Our family loves Yabu ever since we tried it in 2014, it is our go-to restaurant if we are in ATC and Southmall. If the waiting time is so long and we’re hungry, that’s the time we go to another restaurant. My son loves Tonkatsu too, during our first visit he did not order Kid’s Katsu Set so every visit he always shared food with me. But last month, nagbago ang ihip ng hangin. He ordered his own meal. 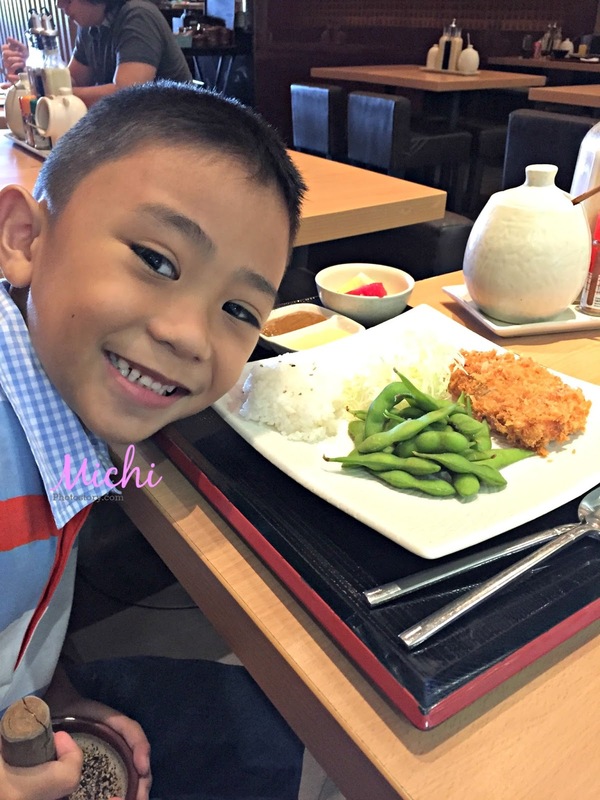 The Kid’s Katsu Set is available for children 10 and below only at P255 per set. 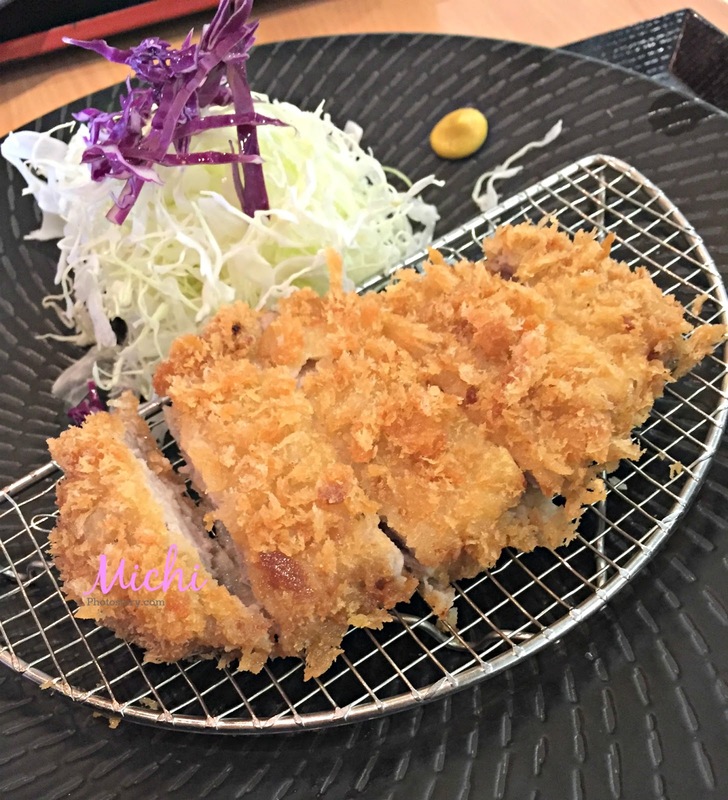 You can choose from Tonkatsu, Chicken Katsu, Cream Dory and Menchi Katsu. 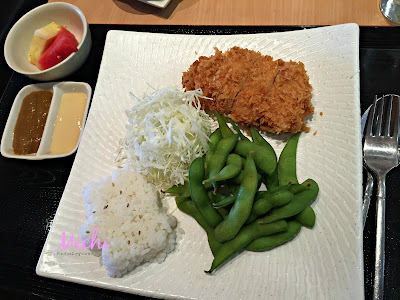 My son ordered Tonkatsu which includes hire, potato croquette, edamame, Japanese rice, cabbage and bowl of fruit. 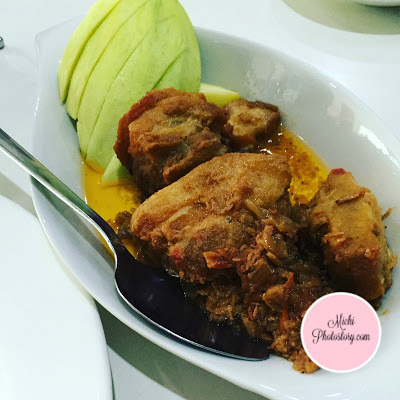 Served with your choice of curry or honey mustard sauce. The potato croquette was not available kaya siguro ang daming edamame. My son just ate the rice and katsu. Our usual order here is Rosu Katsu, we tried other sets like the Chicken and Menchi but we prefer the Rosu Katsu. 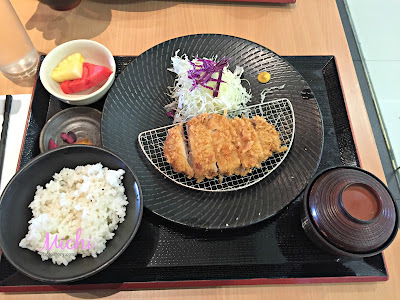 We like Yabu because you can refill the rice, soup, cabbage, and fruits so sulit. The service is good too. What’s your favorite in Yabu? 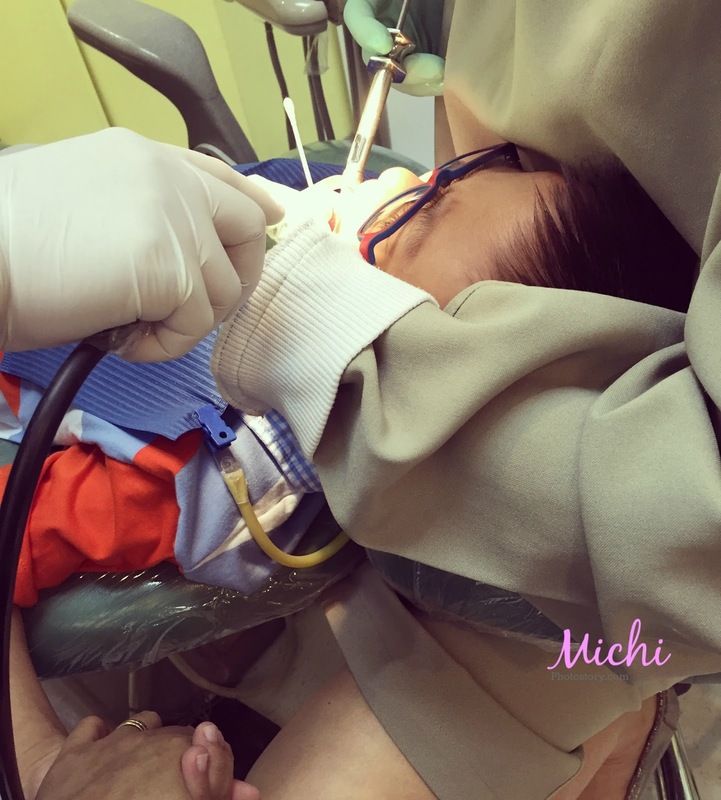 Last month my son visited the pedia-dentist, she advised my son to wiggle the milk teeth in front of his permanent teeth. 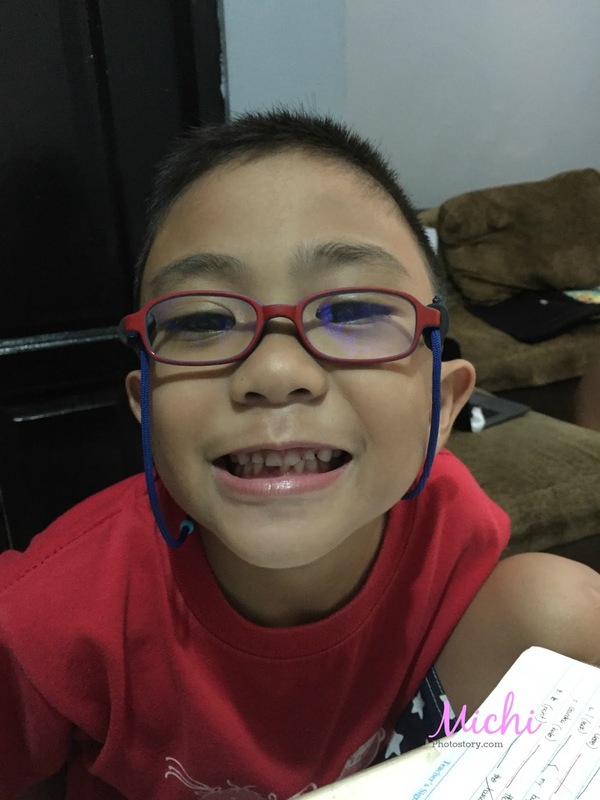 Unlike other kids, my son’s teeth were so intact na parang ayaw ng umalis. The two permanent teeth were out already but the baby teeth are still there so we have no choice but to remove it to give way to the permanent one. A few weeks ago, my son told me that his tooth is already moving so I kept on reminding him to wiggle the tooth so we don’t need to go to the dentist anymore. But of course, he’s so scared of the pain. 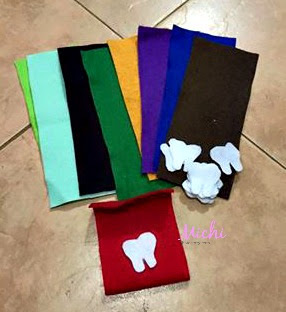 Though he doesn’t believe in Tooth Fairy, I told him I will be his tooth fairy so I sew Tooth Pockets where he will put his tooth and I printed Tooth Record and Tooth Fairy Receipt. Check my Pinterest to know the source of free printables. 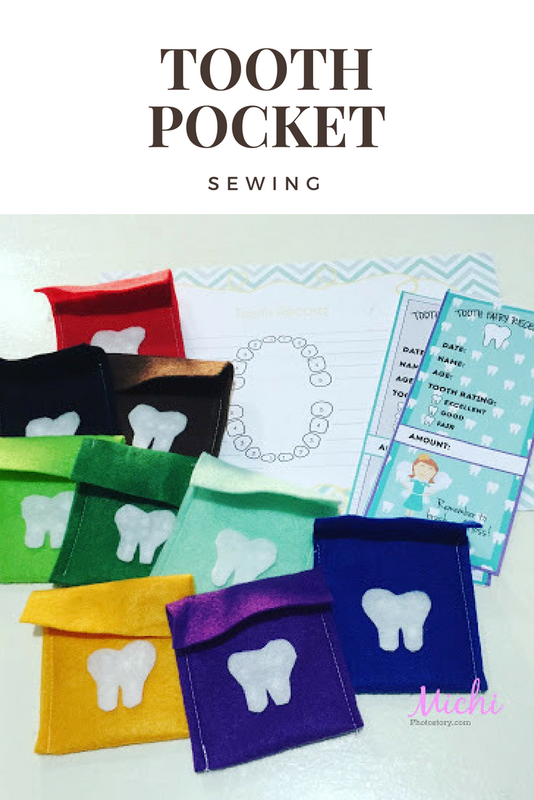 Sewing this tooth pocket is so easy if you don’t want to sew you can use glue. My son was so happy when he saw these tooth pockets. Finally, after several days, he agreed to remove his tooth. My husband showed him a video where the tooth was tied in Nerf Dart. We tried it but the tooth was still there so my husband just pulled the tooth using the thread. The first tooth was out so I was able to save P1,800 for this. I was praying that the other tooth will fall out soon so no more trip to the dentist. But unfortunately, ayaw niya umalis. It was moving pero matigas pa siya para bunutin. Last Saturday, we went to the dentist. We’re running late already because my husband informed me that our schedule is 1PM. Waah! According to my calendar, our schedule is still 4PM, binago pala nila and my husband did not inform me. The staff informed him the day before but he forgot to inform me because he was in Brunei working and went straight to the airport to go back to the Philippines. Anyway, we’re 10 minutes late and waited for another 5 minutes so they can prepare the room. The pedia-dentist asked me kung bubunutin pa ba, mga two weeks matatanggal na daw yung tooth. I asked my son kung masakit na ba yung tooth and he said yes so the doctor said, we need to remove it na. 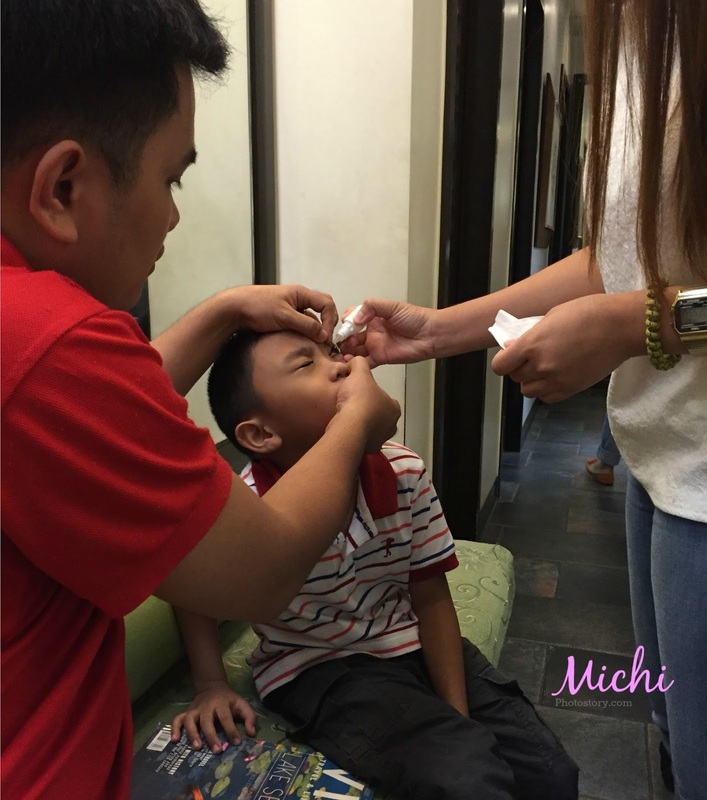 So she explained to my son the step by step, doctor applied anesthesia then after two minutes, injection naman ng anesthesia. I was holding my son’s hand to let him know that I’m just there. He cried during the process, sino ba naman ang di masasaktan di ba. Pulling the tooth was easy as 1, 2, 3, matagal pa yung sa anesthesia. 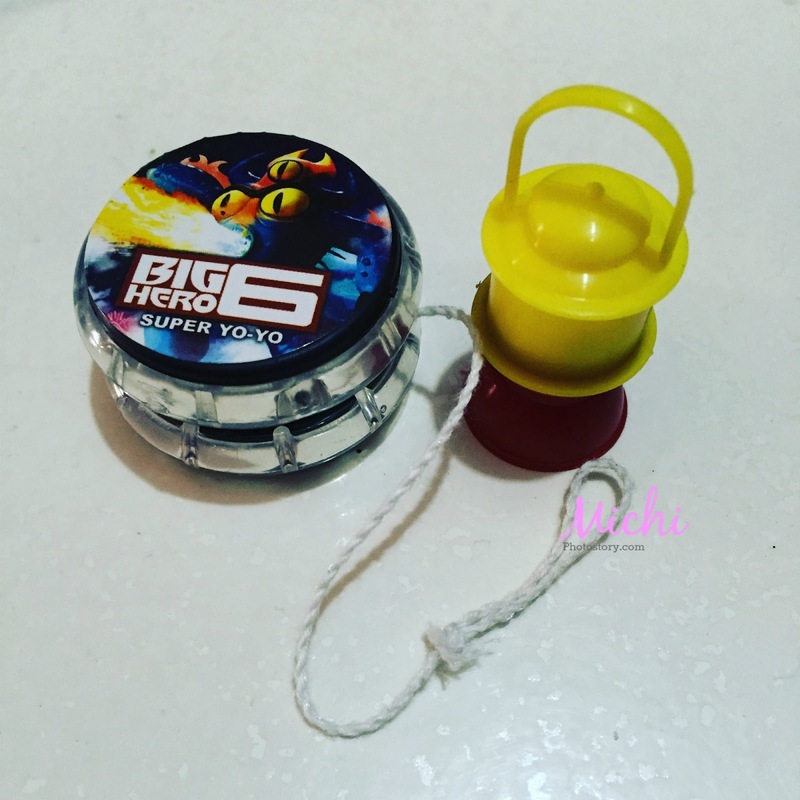 The staff gave him yoyo and tooth holder where they placed his tooth. I was already paying the bill when his dad came, ganun kadali lang and mas matagal pa naghanap ng parking ang daddy niya. My son experienced two ways of removing tooth, so I asked him kung sino mas type niya, si daddy ba o si dentist. 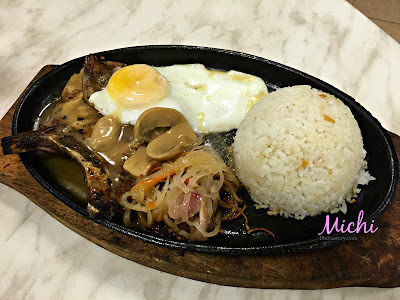 Si daddy na lang daw, hehehe! Sana nga, so I can save P1,800. I know that I can still save money if I will visit other dentist clinic but I don’t want to risk the experience at baka matrauma sa dentist. Not a lot of people know that I’m wearing eyeglasses because I don’t always wear my eyeglasses especially when I’m going out because I’m not comfortable with it. I started wearing eyeglasses when I was in college, I feel and look so old if I’m wearing it so I only use it if I need to read or take an exam. When I started working, I only use it at work then after office hours, I will remove it. When I became a full-time mom, I only wear it if I will read or use the laptop. Yeah, I’m so weird about not wearing my eyeglasses, I tried contact lenses but I’m also not comfortable wearing it. And there are so many do’s and don’ts to follow. I know that I need to have annual check-up but I did not put it on my priority list. I have always been in the hospital for my check-up and labtest (psoriasis or UTI) and sawang sawa na ko to go to different doctors so pati itong sa ophtha, kinatamaran ko na. I always say to myself, I will go to ophtha next year but it never happened for the last several years. I’m definitely sure that going to my ophtha is an additional expense that is why I’m delaying it. 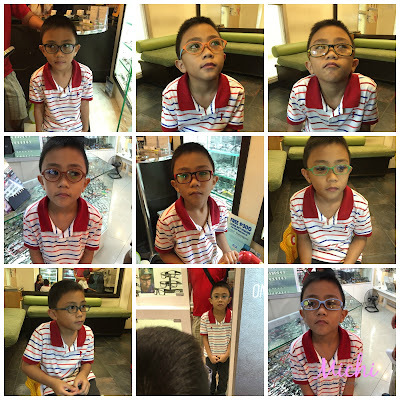 I mentioned before that my son is now wearing eyeglasses and I told him, always wear your eyeglasses ha!. But my son asked me. “How about you mommy, why are you not wearing your eyeglasses?” Toinks! It was a wake-up call that I’m not a good role model. How I can convince my son to wear his eyeglasses if he sees his mom not wearing eyeglasses. So after 8 long years, I finally went to Ophtha. 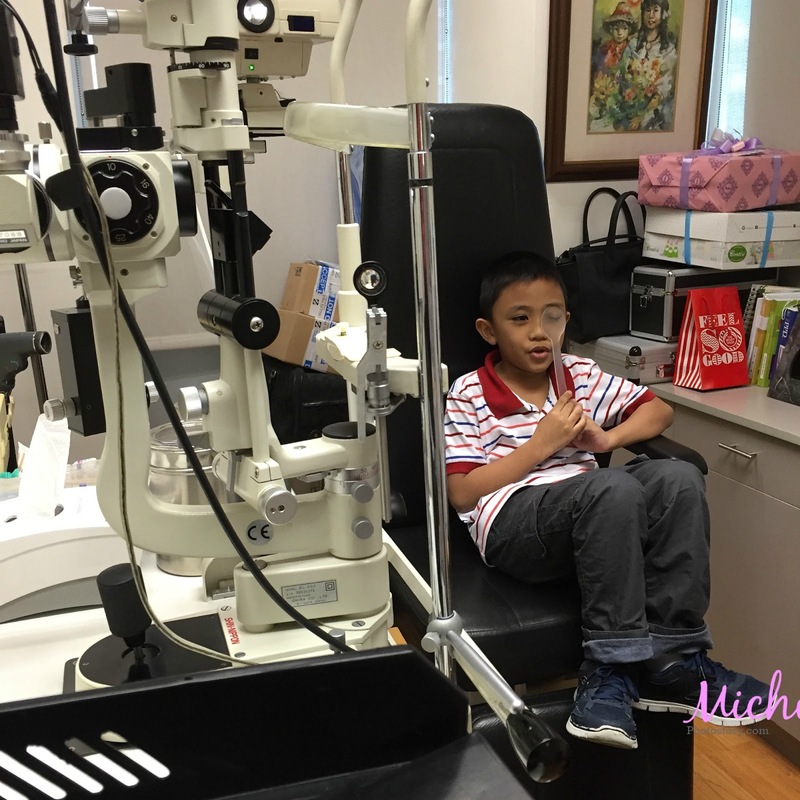 I asked my friend for a referral so after watching my son’s Grade Level Assembly, off we went to Eye Clinic. 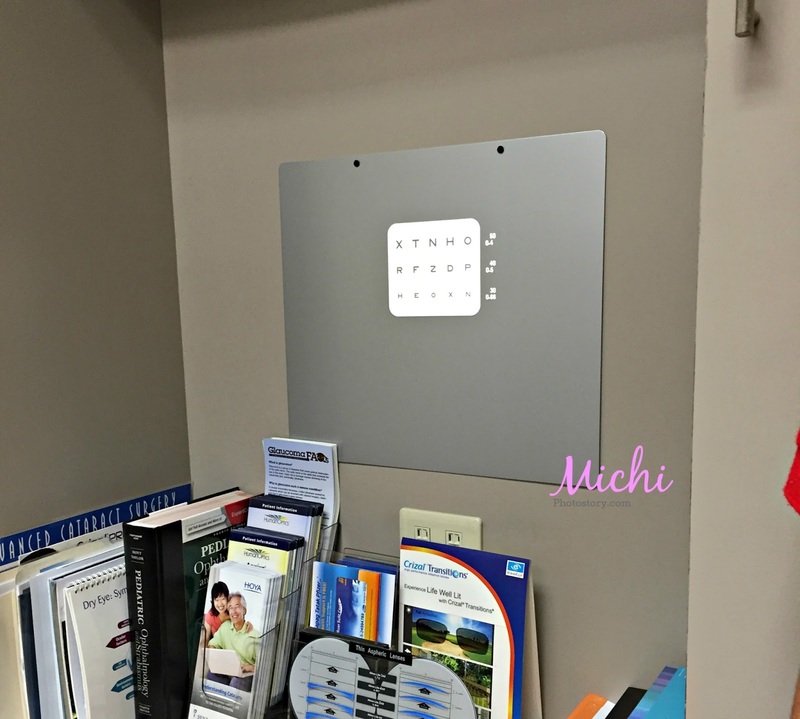 There are different tests that I’ve experienced like visual acuity test and refraction testing to know my correct lens prescription. I was advised that my eyeglasses no longer fit my eyes. The doctor showed me my present grade (eyeglasses) and asked me if I can see or read the letters. Imagine, blurred lahat. From 100 and 25, now 175 and 100 na grado ko. Ang laki ng tinaas dahil ang tigas ng ulo ko. Then she passed me to Glaucoma-Ophthalmologist, the assistant drop fluid in my eyes, anesthesia daw, I'm not sure if for glaucoma testing. I was advised that my eyes are ok, I just need to use the correct lens para di sumakit ulo ko and she prescribed eye drop to prevent dry eyes. Then I need to go back after one year. So lesson learned, take care of your eyes. It took me a long time to realize that my eyes are very important to me, kailangan ko pa ba mapanood ang “Ningning”. I just remembered that my late grandfather is blind, natakot na agad ako. A regular eye exam is very important in order to know if you have signs of getting glaucoma, age-related macular degeneration, cataracts, diabetic retinopathy and especially if you have a family history of eye problem. We have eye problem in our family, both sides, halos lahat nakaeyeglasses. Lastly, there are different lens na pala noh. 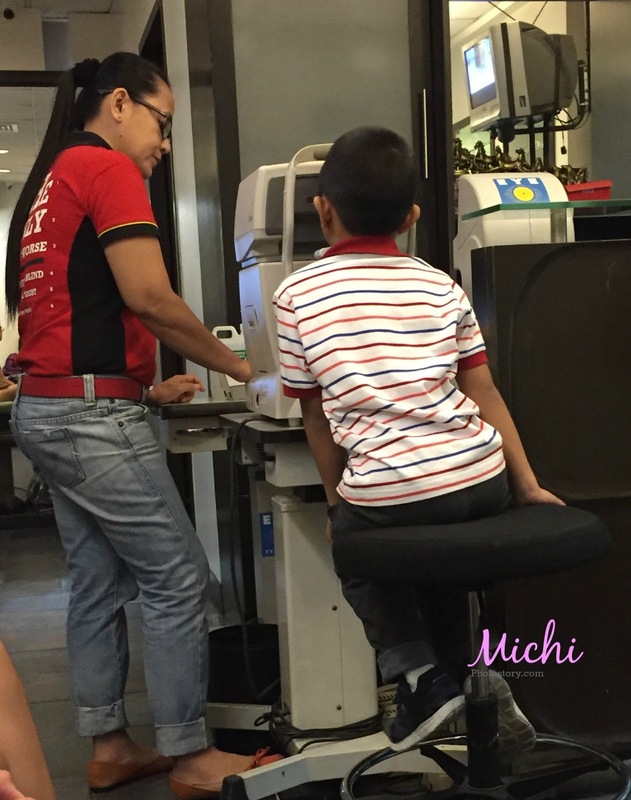 I just discovered it when my son had eye check-up so nakiuso na rin ako. I’m now using a Crizal Prevencia Lens. It is a lifelong benefit of eye protection against harmful blue light and UV. For your vision: reflection, scratches, smudges, dust and water. 7. Light scan technology. Protects against a harmful blue light. I was in hiatus last month so until now I’m not yet finished with my backlogs. 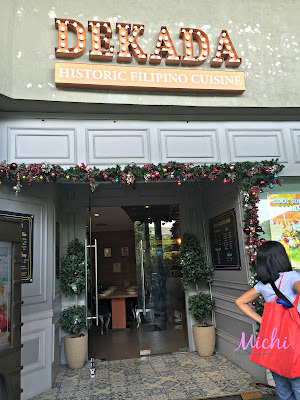 My mom went home last month and whenever she’s home she wanted to eat Filipino foods so when we went to Trinoma we checked the different restaurants and we saw Dekada. 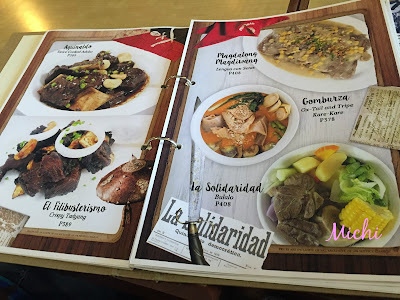 We’re all first timers so it took us time to browse the menu, the name of the meal is very unique. I’m sure you are familiar with the name because you learned that in History class. We wrote all our orders in one piece of paper and gave it to the staff. The staff informed us that some of our orders were not available, nagpapalambot pa daw so we changed it. We ordered Sizzling Pork Sisig P218, Beef Salpicao P328, Binusog na Pusit P278, Aligue Rice P328, Suam na Mais with Squash P128, Crispy Tilapia with Salad P298, Inihaw na Liempo P298, Bulalo P408, Sinigang na Salmon Head P328, Leche Flan P88, Boneless Bangus P248, Calamansi Juice P128 (each) and Pandan Rice. 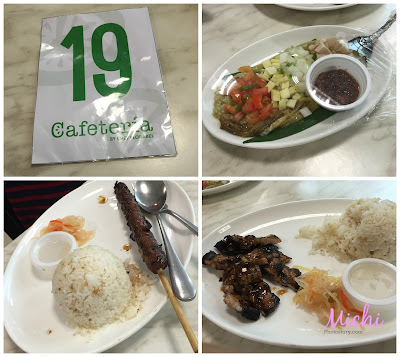 We were informed that it will take 15 to 20 minutes, so we said ok. After 20 minutes, they served the Crispy Tilapia with Salad so we thought parating na rin yung ibang orders, after few minutes wala pa rin lumalabas. So we asked the server to serve 1 cup of plain rice so my mom could eat her food. My mom almost finished with her meal before our order came. 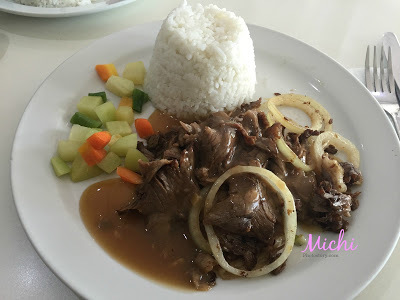 We liked the Bulalo because the meat is very tender but not the Inihaw na Liempo, ang kunat niya. 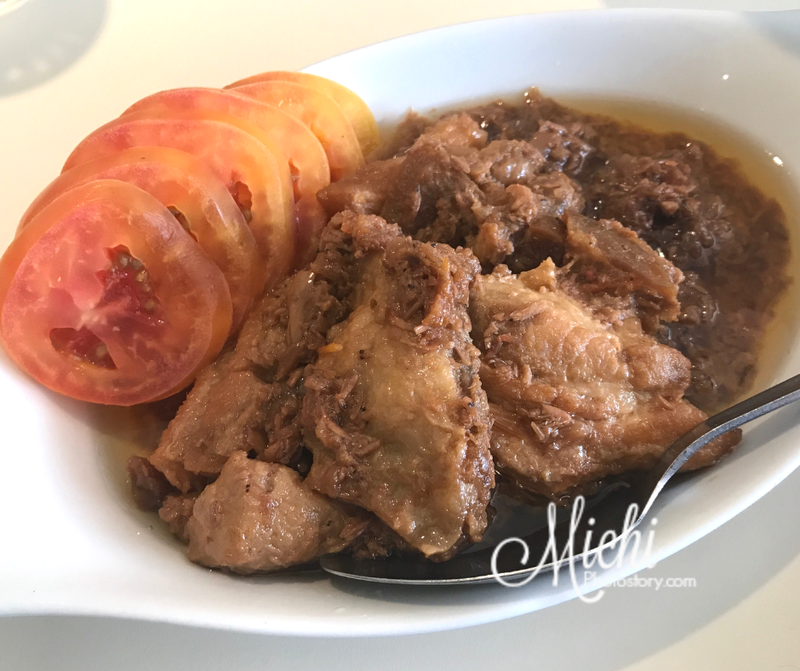 We’re so busy eating and my sister said, nasan na yung ulam namin? Waah! 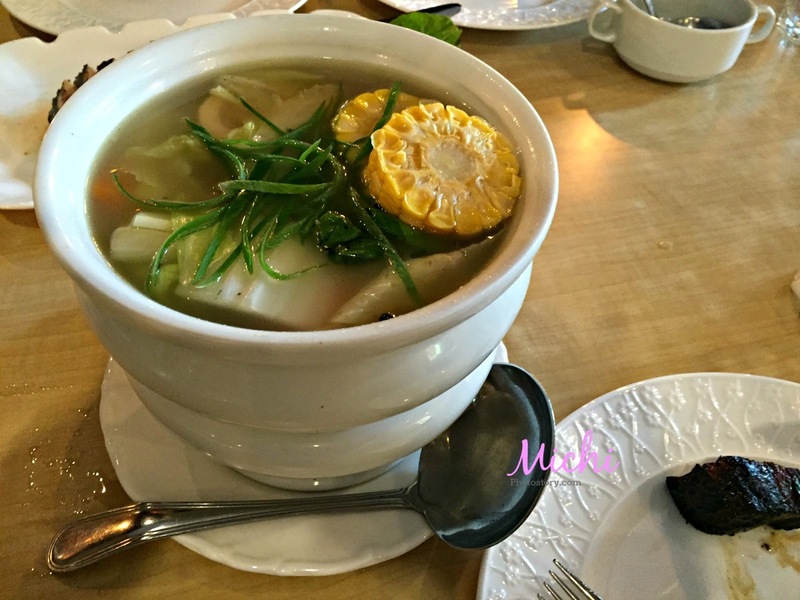 Hindi pa rin pala complete, so we follow up again the Sinigang na Salmon. To think na ang bilis lutuin ng salmon di ba. Ang layo sa picture sa menu, nagshrink dito ang beef salpicao. Taste is ok.
My sister in law asked for the refill of calamansi juice and the staff said, hindi po bottomless yung calamansi juice, dalandan lang po. What? It is clearly stated in their menu Calamansi juice/Dalandan juice bottomless P128. They should change that, nakakaloko or they should inform na regular drink lang yun pag inorder ang calamansi. 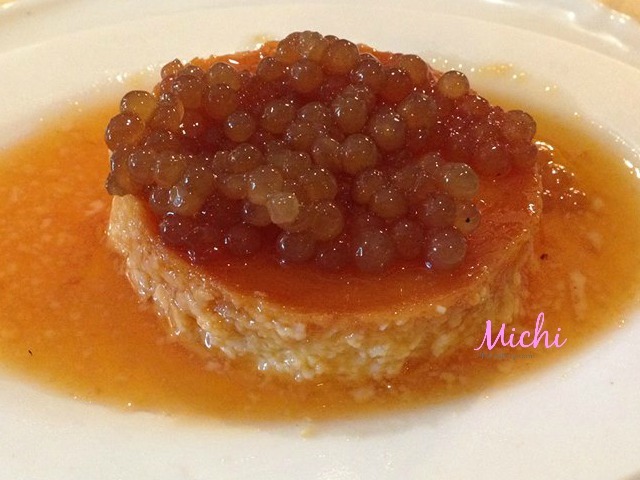 We’re already paying our bill, when we have to follow up again na kulang pa ng isang leche flan yung naserve. Hayz. We’re really disappointed with our experience, very slow service. 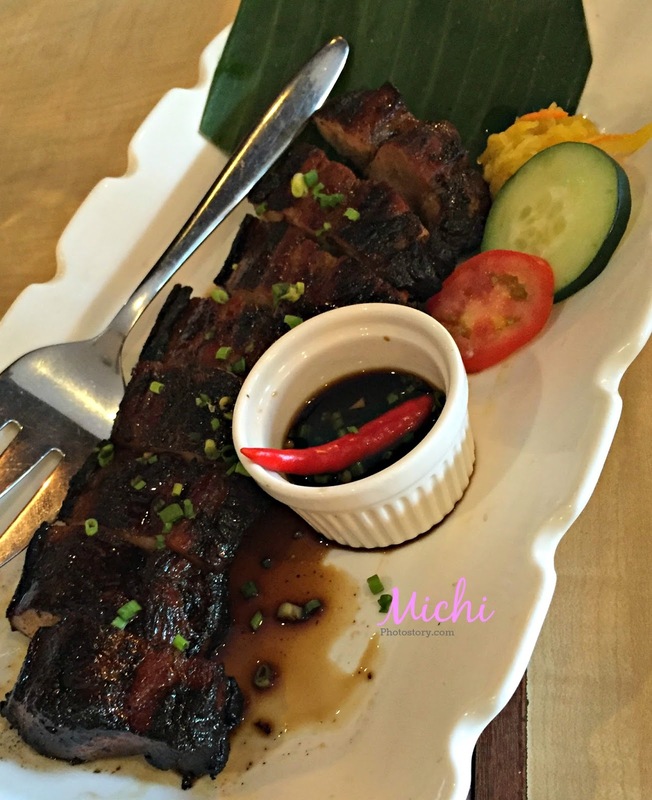 The 20 minutes became 45minutes and kulang kulang pa rin order. 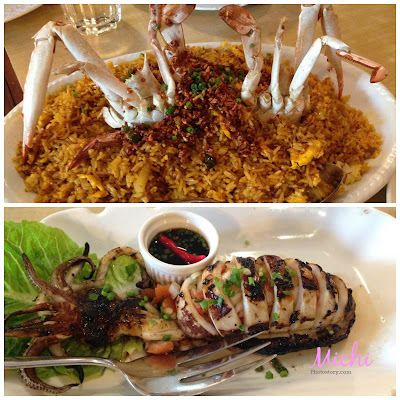 I was not able to try the other dishes so I don’t know if they liked it or not. The interiors is nice, the price is reasonable but they need to improve their service and update their menu. We had staycation in our home last holiday break, no grand vacation for us but at least I had time to finish my “things to do” list before the end of the year. 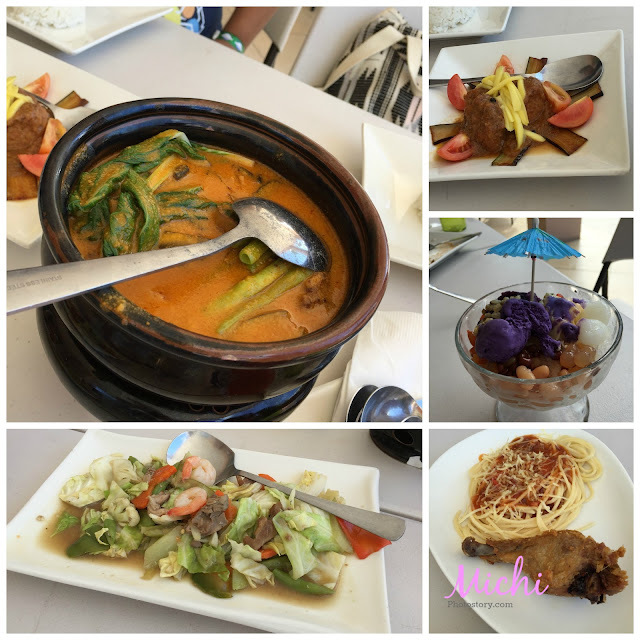 Since it was a last minute decision, we were choosing from the resorts that we have tried in Batangas. Check it here. We chose Canyon Cove again because both pool and beach are nice. Nasugbu is also near, paglagpas lang ng Tagaytay. He called the resort and asked if they accept day-tripper and the staff said yes. He called his mom to ask if they want to join and off we went to Canyon Cove the following day, December 27, 2015 at 5:30AM. At the gate, the guard told us na fully booked na daw sila but we told him na day trip lang kami. After parking, the guard ushered us to the Day Tour Counter and he even helped me in carrying some of my stuff. Medyo malayong lakaran siya ha, dati may kiosk lang sa labas, now nasa loob na ng building. 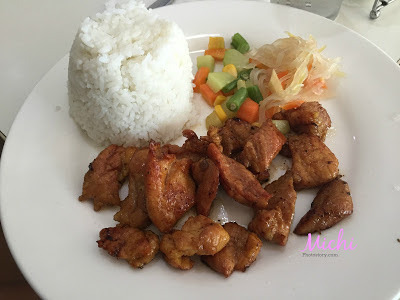 I did not bother to check the rates because we just went there last March 2015 so I was really surprised when the staff told me, Ma’m P4500 lang po itong cash. P5500 pala ang total. Toinks! Most of the time, my son prefers the pool because may shark daw sa beach. Hehehe! 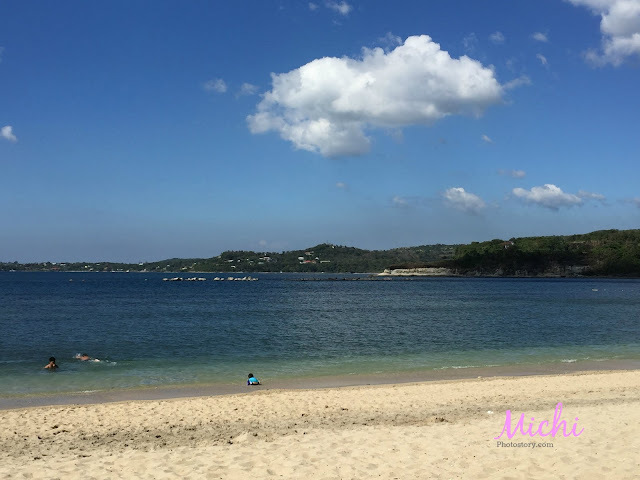 But after we went to Acuatico Beach Resort and Hotel, love na niya beach. 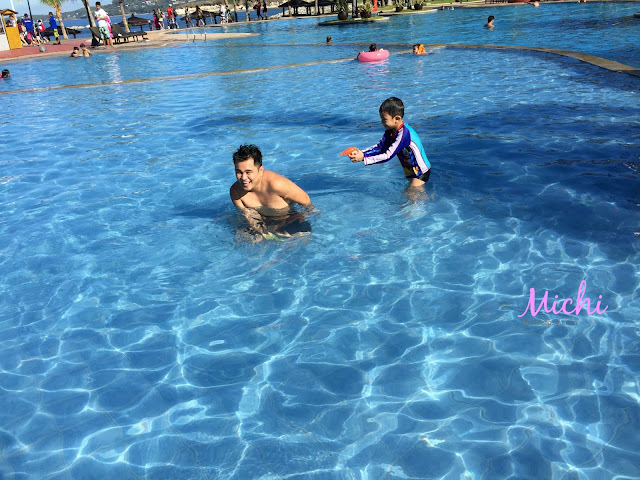 So after several minutes in the pool, he wanted to go to the beach na. 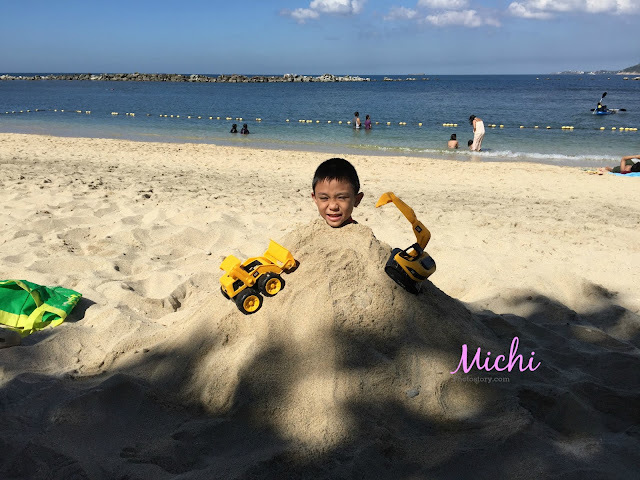 He enjoyed playing in the sand. Then we ate in Island Cafe (Max’s) for our lunch, we ordered Chicken and Spaghetti for my son because he likes the chicken, Chopsuey, Kare-Kare, Pork Binagoongan and Halo-Halo for dessert. Then we spent most of our time at the beach so it is better if you bring a blanket so even you do not have a cottage, you can stay under the trees. 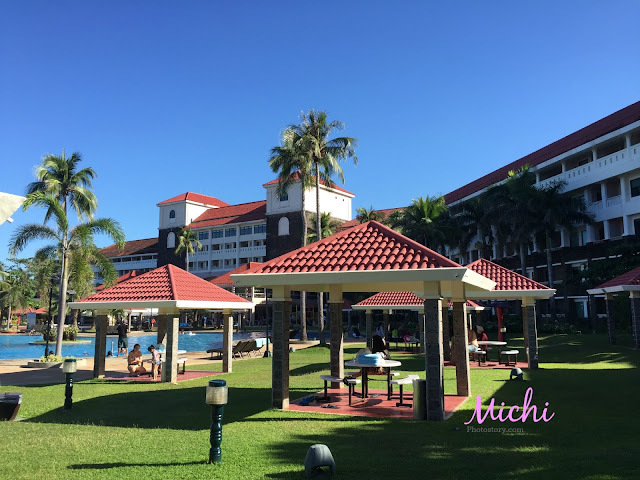 If you prefer pool, there are tents there where you can stay beside the restaurant. 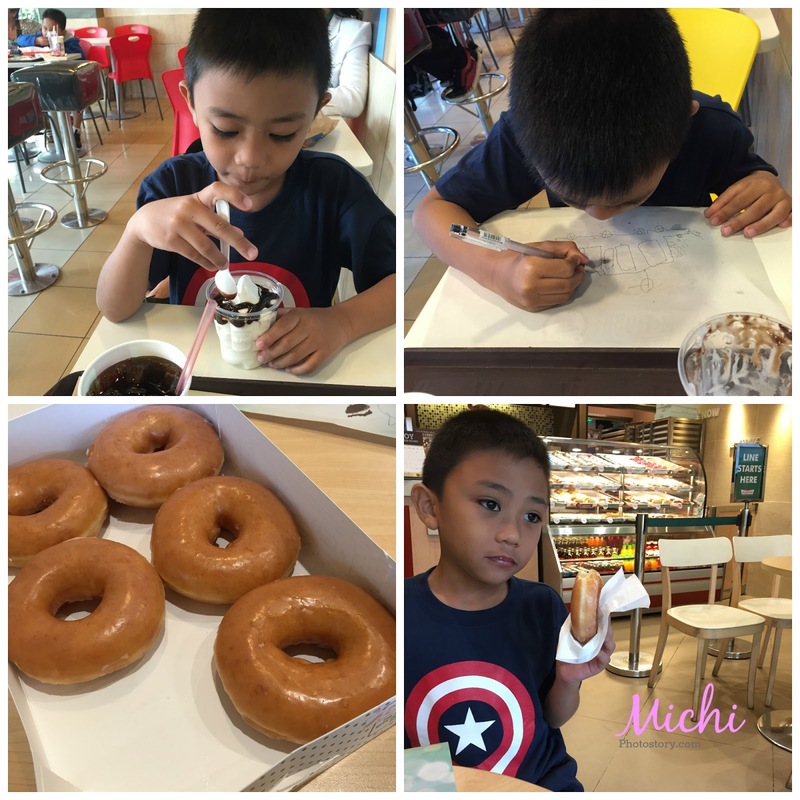 This was our last travel last 2015. 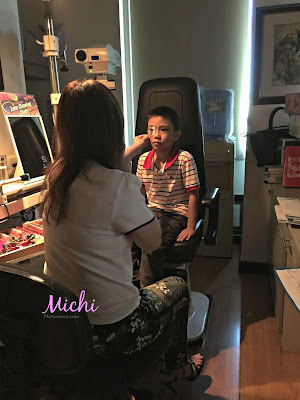 I received my son’s Annual Physical Examination (School) last November and there was a note that we need to see ophthalmologist. I immediately asked my friend for the contact number of their pedia-ophtha because I know that it is not easy to get schedule. There are only limited number of pedia-ophtha here in the Philippines. My husband called and the earliest we got is December 22, 2015. 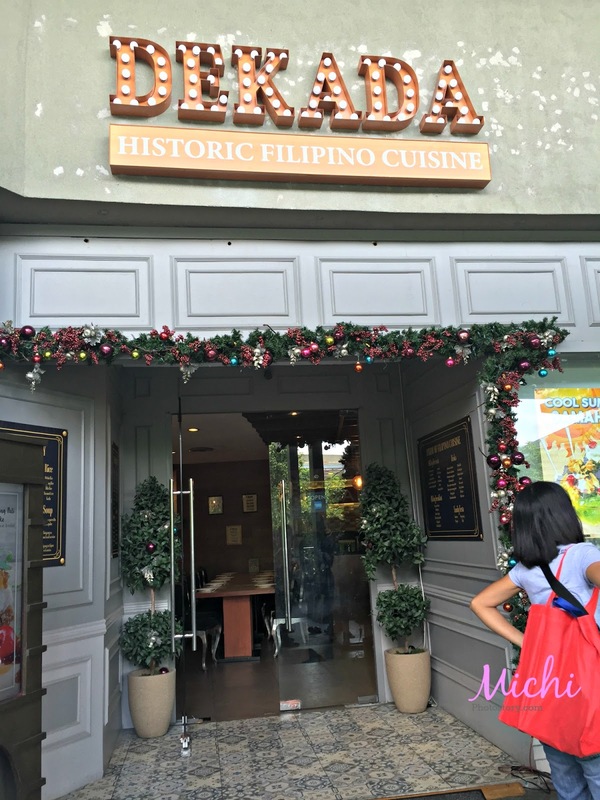 So aside from preparing for the holiday last year, we’re so busy going to hospital, I mentioned before that we went to pedia-dentist last December 18. When I saw the result of my son’s APE, I felt sad because I know that he needs to wear eyeglasses and he is only 7 years old. 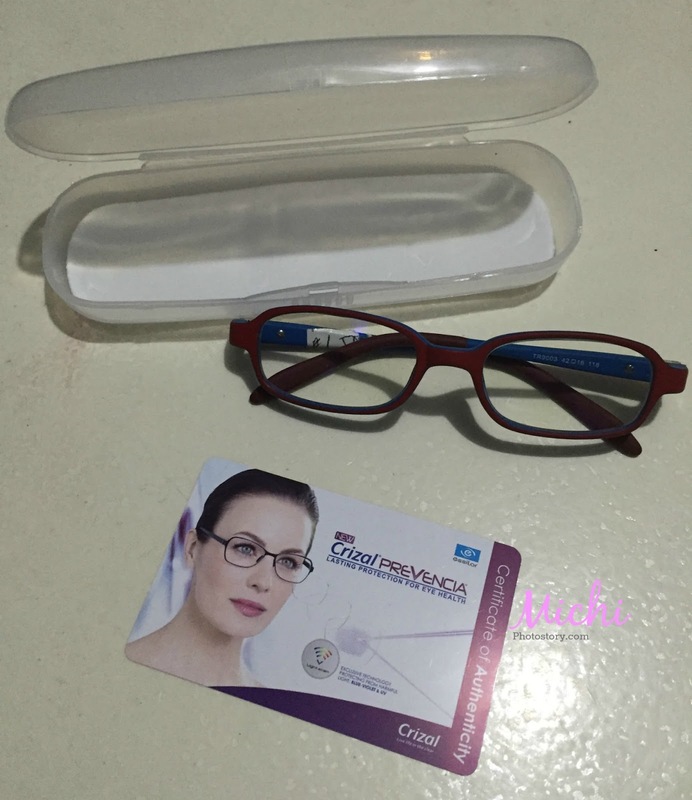 Wearing eyeglasses is not easy because you have to take care of it and it might limit you to do some activities. Fast forward to our check-up, first step was this. You have to look the at picture inside the machine. Next, the doctor called us, I gave the result of APE and he checked my son. He let my son read the letters. There was a time that we’re repeating the instruction of the doctor because my son was not reading the letters. We thought that he was not listening to the doctor so we have to repeat it but the sad truth is, he can’t see the letters, that is why he’s not saying anything. My husband was so silent at that time because he can’t accept the fact that there is something wrong with my son. 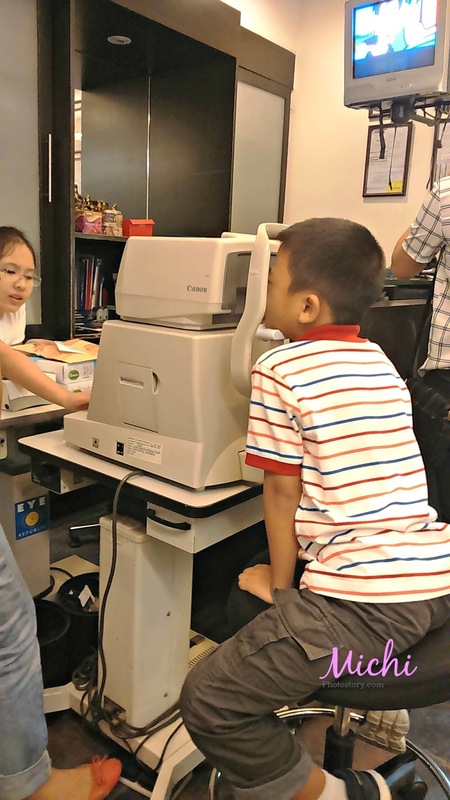 At his age, my husband has 20/20 vision while my son needs to wear eyeglasses. 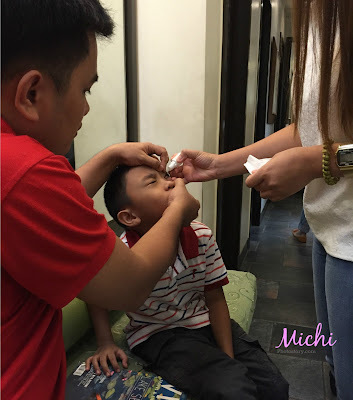 Then we went out for some test, the assistant drop liquid in my son’s eyes to relax the eyes, one drop in each eye. Three times yun, I’m not sure kung every 15 minutes. Then check-up again in this machine. After that, the doctor called us again to measure the correct grade for my son. She said that my son has astigmatism and farsightedness. She explained the terminology. She also said na buti may check-up sa school kasi mas naagapan daw yung mata. 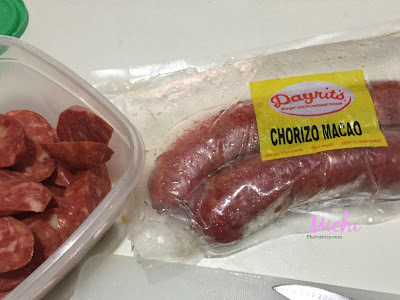 If we notice daw na lagi nababangga or natatapilok anak namin, dahil yun sa mata. 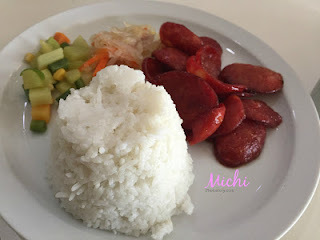 Imagine, there are times that I think na clumsy anak ko kasi pag nasa mall kami, natatapilok or nababangga siya kaya lagi ko talaga siya hawak. Yun pala, there is something wrong with my son’s eyes. 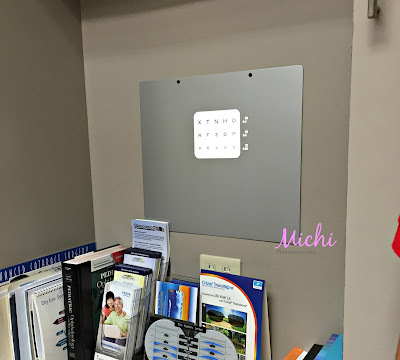 We will go back after two months to see if there is improvement after wearing eyeglasses. I was also thankful because the school has annual check-up because we don’t have that in our health card so at least we were able to go to doctor immediately. After that, eyeglasses hunting na kami. 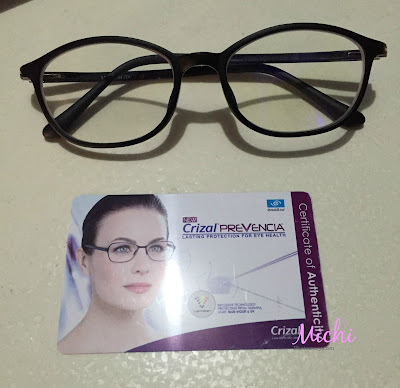 Nakakalula pala ang price ng salamin sa mall and wala rin naman gaanu difference sa clinic so we went back to our pedia-ophtha’s clinic and dun na rin kami nagpagawa ng eyeglasses, P1500 frame + P4000 lens. And because of the holiday, January 5, 2016 na narelease yung eyeglasses. 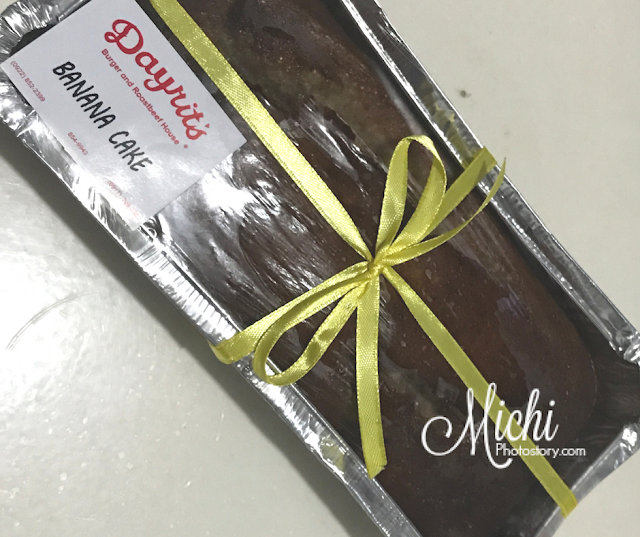 Super remind ko sa anak ko na alagaan ang salamin. Hehehe! Astigmatism - the cornea or the lens, has an abnormal or irregular curve. Vision is disordered, could be blurred, unfocused or fuzzy. Symptoms: dizziness and excessive squinting or closing of the eyes. Hypermetropia - farsighted - inability to see near objects clearly in focus. Symptoms: uncomfortable vision when reading, headaches and tired eyes. 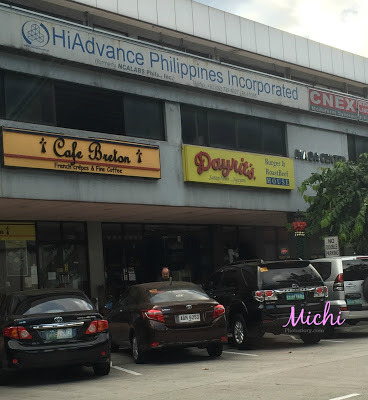 We went to Manila last month because my husband will get the stuff that he needs to install our CCTV camera at home. The traffic was bad and my son and I wanted to pee. 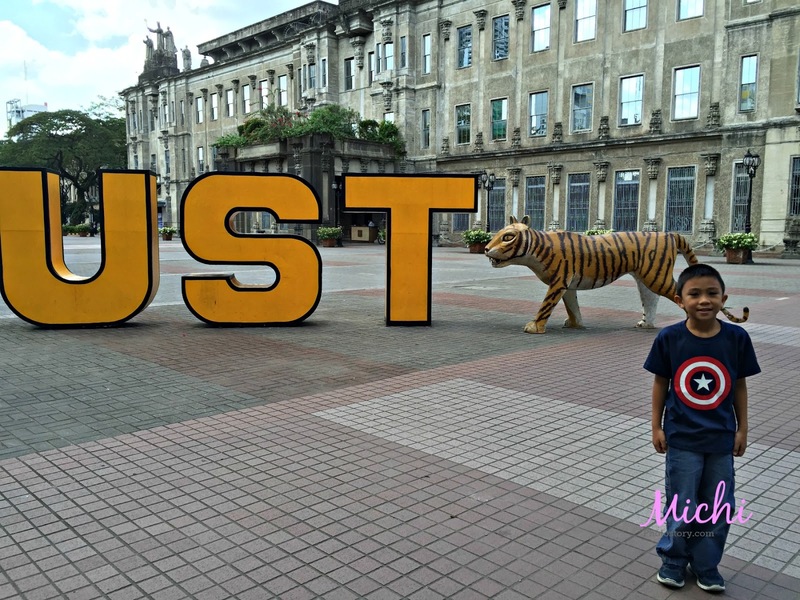 We saw UST and I told him that we will just stay in school and balikan na lang niya kami. 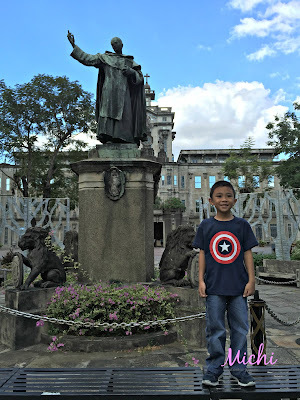 I was sharing our story to my son and showing him our school. Ethan: Mommy, look at the church. Me: (insert smile) That’s not a church, it is called Main Building. Monument Replica of arch door of the old university building in Intramuros erected in 17th century as it survived the war of 1941-1945. 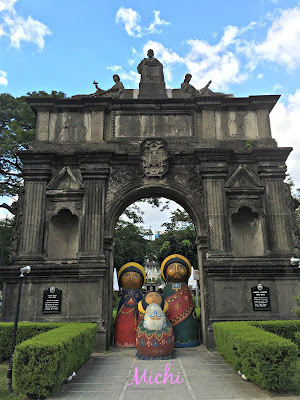 Arch of Centuries gate-way to history of the finest breed of Filipinos. There are so many changes in the school, when we are still studying there are no fastfood inside the university. I remember that we had bazaar here during our Commerce week but now kainan na siya. 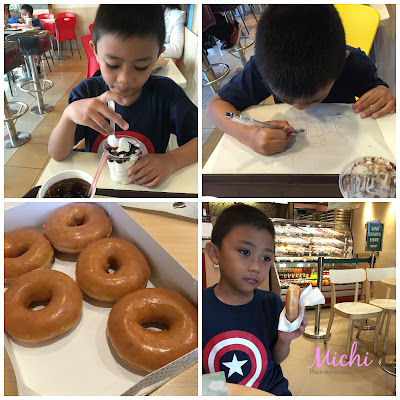 We stayed in McDonalds while waiting for my husband and dahil nahihiya na ko at ang tagal na namin dun, we transferred to Krispy Kreme. 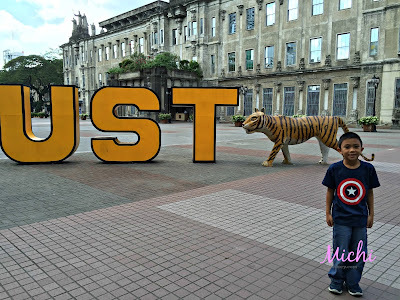 - University of Santo Tomas is also known as UST, Pontifical and Royal University of Santo Tomas or The Catholic University of the Philippines. - founded on April 28, 1611 by Archbishop Miguel de Benavides. 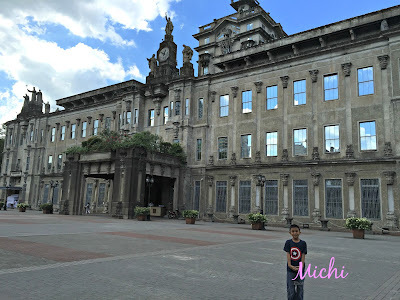 - largest university in Manila. - this is the only university that have been visited by different popes. 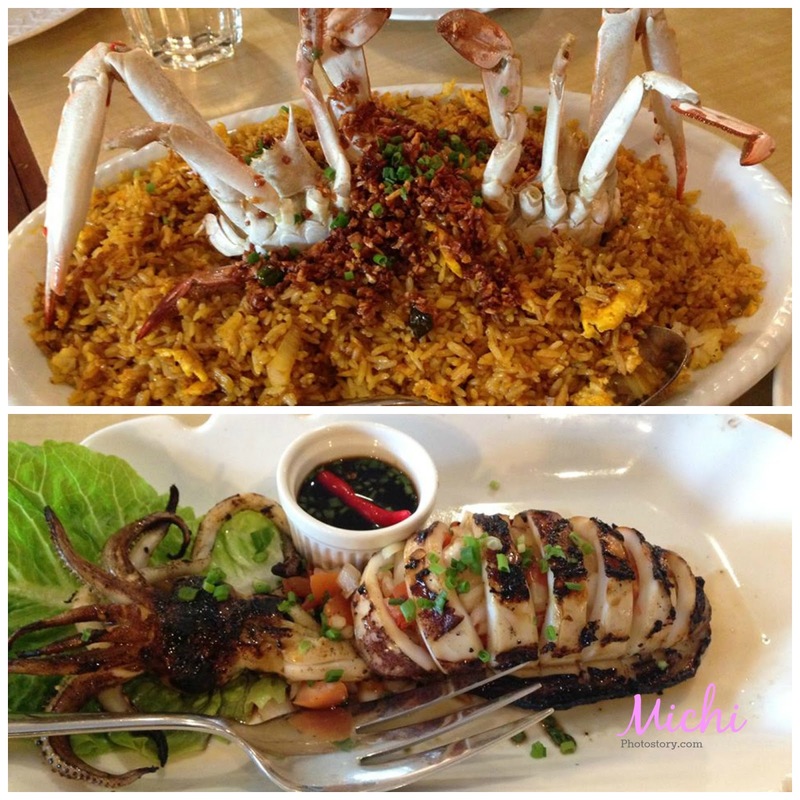 - was declared a National Historical Landmark on May 24 2011 buy NHC of the Philippines.